Over winter I came to love a simple, yet delicious soup that I would often make for myself if I was home for lunch, or as a “pre-dinner snack.” What began as a way to get rid of opened tins in the fridge evolved into a tasty and warming dish that I really enjoy eating. This soup requires no alterations to be fully vegan, though you can sub in chicken stock for the vegetable stock if it’s all you have. I often make my soups vegetarian; I think we rely too much on meat in our diets and, while I have unsuccessfully tried to go vegetarian twice now (every time I’d spend 6 months with cold after cold and the last attempt I believe triggered my gastritis) I do my best to limit meat intake to smaller amounts and free range whenever possible. Use a pumpkin that is low in FODMAPs/that you tolerate. Jap pumpkins, or the American style pumpkin (think Jack-o-lanterns) are safe. Tomatoes are low FODMAP – just make sure, if you aren’t using fresh toms, that you use tomatoes that have not been concentrated at all, such as tomato paste. Your best bet for tinned tomatoes is to buy whole peeled in a tin and puree them yourself. 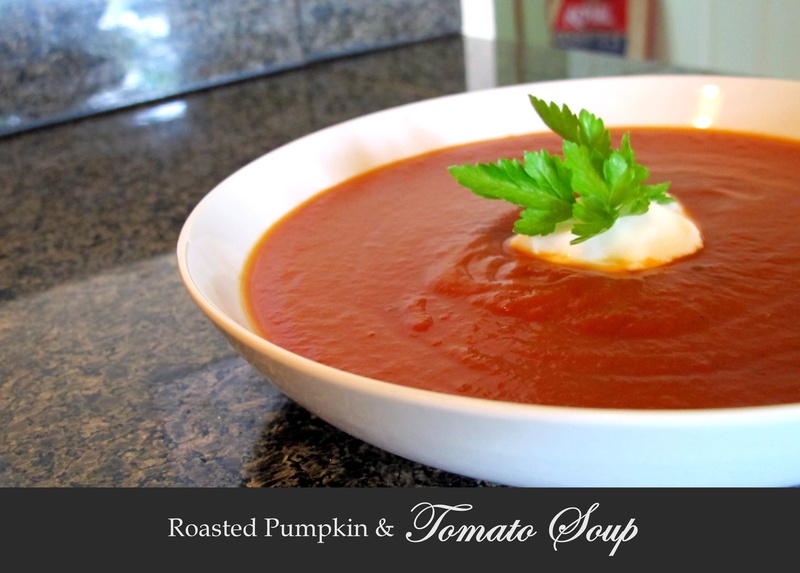 Tinned pumpkin and tomatoes can be used in a pinch but fresh always tastes better. Use whatever you have time for! If you do not need it to be vegan, you can use this FODMAP friendly chicken stock recipe and add the sour cream at the end – if you can tolerate lactose, of course. If you have not done so already, peel your pumpkin, weigh out 425 g, dice it and roast at 180 C/350 F for about 30 to 45 minutes, or microwave until done. Once cooked, puree the pumpkin in your blender/food processor. In the mean time, weigh out your tomatoes, bring a pot of water to the boil and score from top to bottom, dividing the tomatoes into quarters. Score, do not slice. 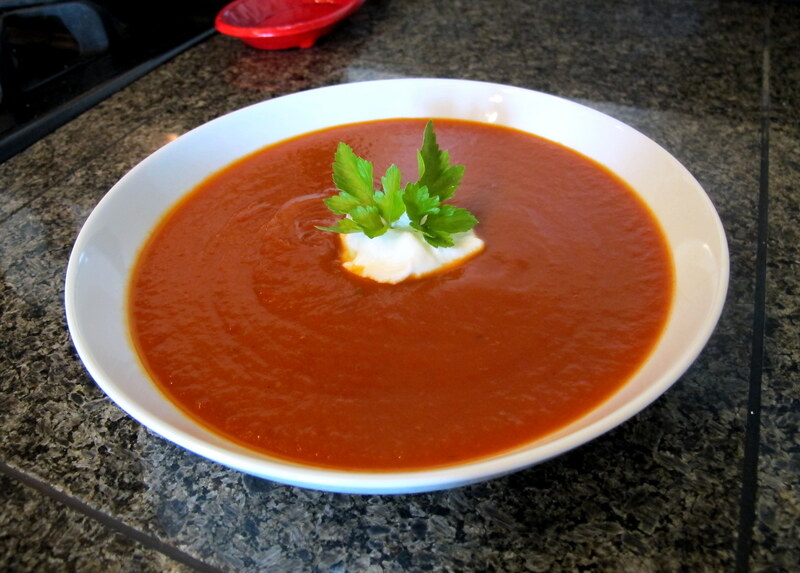 Fill another large bowl up with ice cold water to halt the cooking process once the tomatoes are out of the pot. 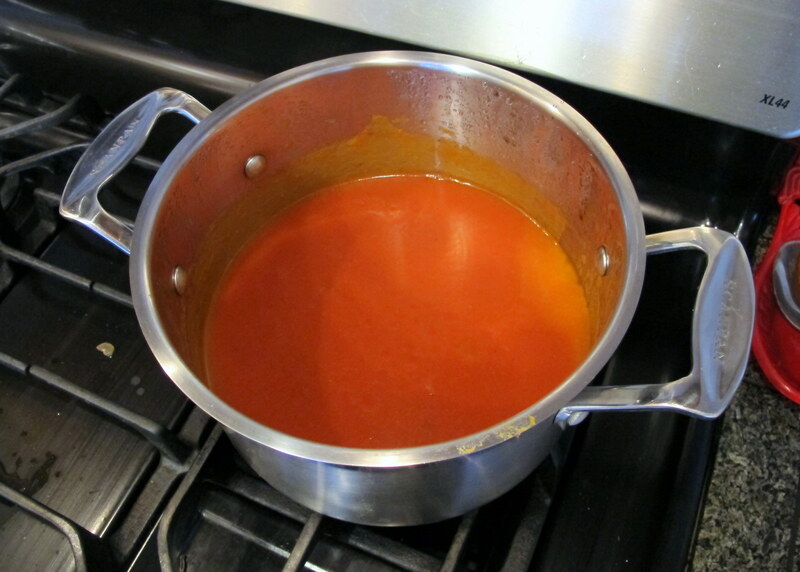 Reduce the water to a simmer and then drop in your tomatoes; count to 30 seconds, remove the tomatoes and put them quickly in the cold water for 5 minutes. This is called blanching. To peel the tomatoes, stick your finger or the handle of a tea spoon under the scored edges – which should have lifted – and work the skin off. Next, de-core the tomatoes before pureeing them in your blender. Combine all the ingredients (in order) in a sauce pan over a high heat and bring to the boil. Let the mixture boil for a couple of minutes before reducing it to a simmer and cooking for an hour with the lid ON – it doesn’t need to reduce much. Adjust salt and pepper to taste. To keep it warm until required, just leave it over a low heat with the lid on, to prevent further reduction. Enjoy it with a slice of suitable bread (if you can tolerate a little rye, have you tried my ryce bread? ), cornbread or a savoury muffin (pumpkin muffin recipe to come soon). This entry was posted in Entrees, Appetisers and Sides, Lunch, Soups, Vegetarian or Vegan Entrees or Sides and tagged appetiser, dinner, entree, FODMAP, FODMAPS, food, fructose friendly, fructose malabsorption, healthy, home-cooked, homemade, Jap pumpkin, low fat, pumpkin, pumpkin and tomato soup, pumpkin soup, soup, squash, tomato, tomato soup, vegan, vegetarian, vegetarian week, veggie week, veggieweek. Bookmark the permalink.